Crawley Town suffered a late defeat at Mansfield Town, decided by an 88th minute goal by Tyler Walker. Head coach Gabriele Cioffi made three changes to the line-up which lost at Stevenage with new signing Tom Dallison making his first start of his second spell in the Town defence. Filipe Morais started for the first time after returning from a finger injury which saw him sidelined for eight matches. Lewis Young also returned to the starting line-up following injury. David Sesay and Panutche Camara were on the bench while Josh Doherty was left out of the squad. Mansfield made four changes with new signings Nicky Ajose, a former Crawley loanee, making his debut on loan from Charlton and midfielder Jorge Grant who is also on loan from Nottingham Forest also starting. Crawley enjoyed a good first half with Mark Connolly going closest to scoring in the 12th minute when he headed a free-kick by Josh Payne against a post. Mansfield had shots by Ajose and CJ Hamilton, saved by Reds ‘keeper Glenn Morris, including a save with his legs to deny the Charlton loanee. Hamilton later lifted a chance onto the roof of the net after Morris narrowed the angle. Dallison was booked after 30 minutes for taking down Hayden White who was racing down the right flank. Just before half-time Hamilton drilled the ball across the face of goal while George Francomb made a fantastic block to deny Grant. At the other end Morais blasted a shot from 20 yards straight to Stags’ ‘keeper Jordan Smith. Dominic Poleon was penalised for handball just as he was about to shoot in the six-yard box. Ajose should have scored early in the second half when from the six-yard box he lifted a pass well over the bar. Poloen tried to take advantage of a mistake but struck his shot from the edge of the area wide. Assistant coach Nathan Rooney was booked for protesting at Poleon being penalised. Morris tipped over a chance by Jacob Mellis as Mansfield searched for the opening goal. The referee waved on when the home fans called for a penalty following a jostle by Connolly and Krystian Pearce. 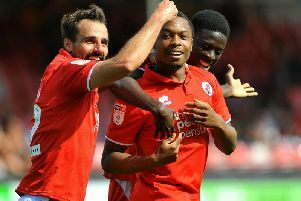 Reds should have taken the lead with four minutes to go when substitute Camara saw a shot deflected over the bar after an initial attempt by Ollie Palmer came out off Smith. The deadlock was finally broken in the 88th minute when a cross came in from White to Walker who got the better of Connolly to strike past Morris.